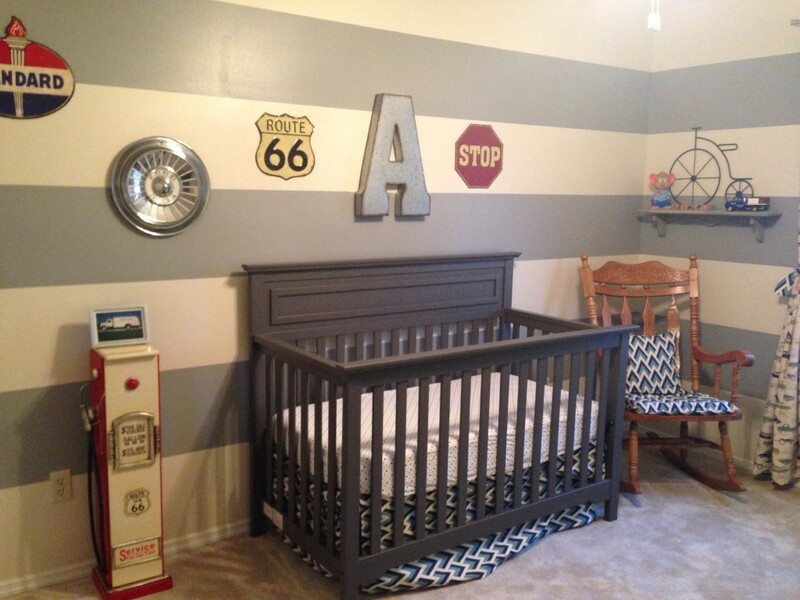 We wanted to do a vintage car themed nursery for our newest addition to our family! We went to a fabric store and picked out 3 patterns we loved and the room idea came from there! That helped us pick the room colors and design! We striped the rooms with a easy chalk line and painters tape! The dressers were painted with Cece Caldwell's Spring Green chalk paint and distressed Cece Caldwell's Seatle Mist. The street signs, letter A & motorcycle came from Hobby lobby. The crib came from Wayfair. I sewed the bed skirt, pillows and cushion on the rocking chair, the curtains and the changing pad! The dressed dressers really brought the room together and made them pop! The gas pump is adorable and useful! Has shelves in it! And my Grandpa's picture on top is so cool to bring him into the room! I love all the vintage hub caps as well! Look for things you can paint and make your own! Also use any other talents you may have like sewing! Really saves you money! And stripes were really easy to do and really add movement to the room! I am a first time mom living in the heart of the midwest! I love any thing crafty and DIY!